(A) BMD increased in women and men (aged >65 yr) at the femoral neck and spine over 3 yr then decreased when supplementation was stopped. Adapted from Dawson-Hughes et al. (12). (B) Calcium supplementation slowed remodeling [reflected in the decline in N-terminal telopeptide (NTx), a marker of bone resorption], then increased when supplementation was stopped. Adapted from Prestwood et al. (13). Meta-analysis by Shea et al. of antifracture efficacy studies in trials of postmenopausal women randomized to calcium supplementation or usual calcium intake. Results do not support fracture risk reduction in the lumbar spine. Pooled BMD difference after treatment with calcium compared with controls was approximately 1.5 to 2%. *Exercise arm of Nelson trial. CI, confidence interval; WMD, weighted mean difference. Calcium supplementation increased BMD at the spine but not at cortical sites. (A) Intent-to-treat analysis over 5 yr showed no between-group difference in BMD change during the last 30 mo. (B) Per-protocol analysis indicated that between-group changes differ in the total hip during the last 30 mo, which may be driven by a greater decline in placebo, a lesser decline in the supplemented group, or both. Adapted from Reid et al. (21). (C) BMD was higher in the supplemented postmenopausal women versus the control groups during the first but not second year, consistent with a reduction in the remodeling space deficit. FN, femoral neck; LS, lumbar spine; TB, total body. Adapted from Dawson-Hughes et al. (12). Meta-analysis by Shea et al. 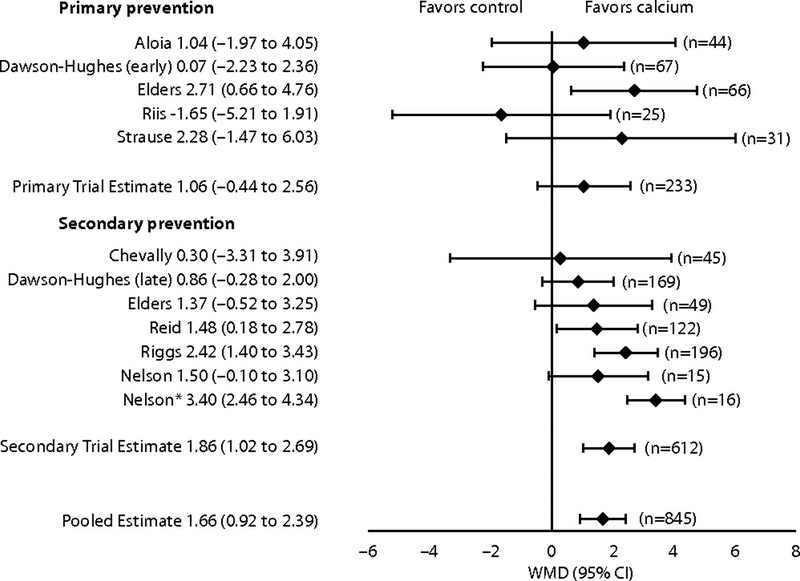 of antifracture efficacy studies in trials of postmenopausal women randomized to calcium supplementation or usual calcium intake. 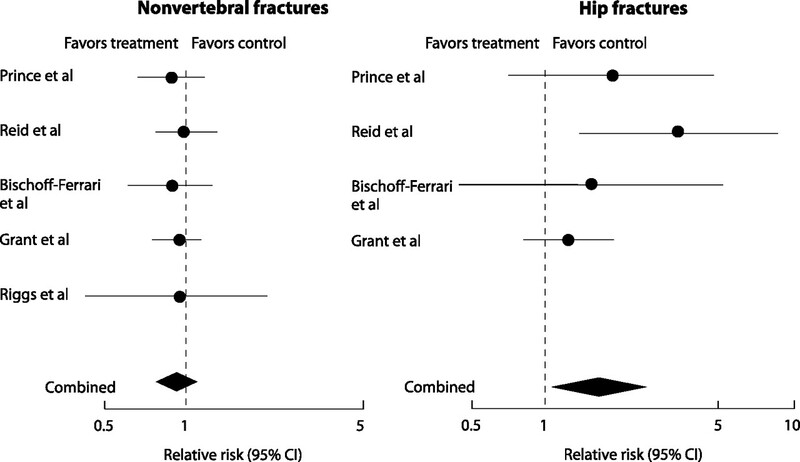 Results do not support fracture risk reduction in either vertebral or nonvertebral fractures. Figure: RR of vertebral fracture after treatment with calcium. Box: A NS trend toward reduction in vertebral fractures in the calcium-treated group was seen in five trials reporting vertebral fractures as outcomes; similar results were noted in two trials reporting nonvertebral fractures (17). Meta-analysis of Tang et al. 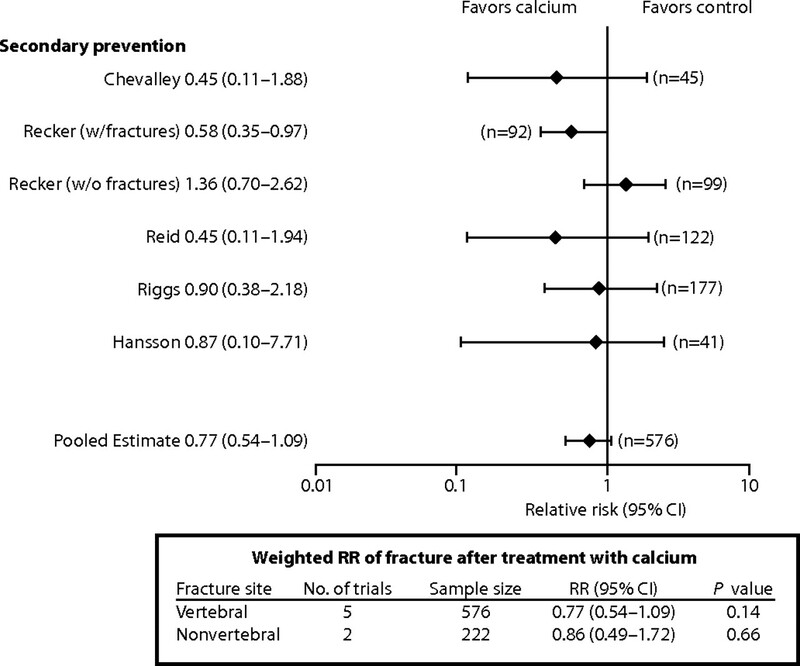 of 17 trials in which patients (n = 52,625) aged ≥50 yr were randomized to supplementation with calcium or calcium/vitamin D. Calcium supplementation with or without vitamin D produced a statistically significant 12% risk reduction in net fracture for all types of fractures (18). (A) The risk reduction for fractures was 24% in compliant subjects (compliance rate ≥80%), but no risk reduction was observed in those with poor compliance (compliance rate <80%). 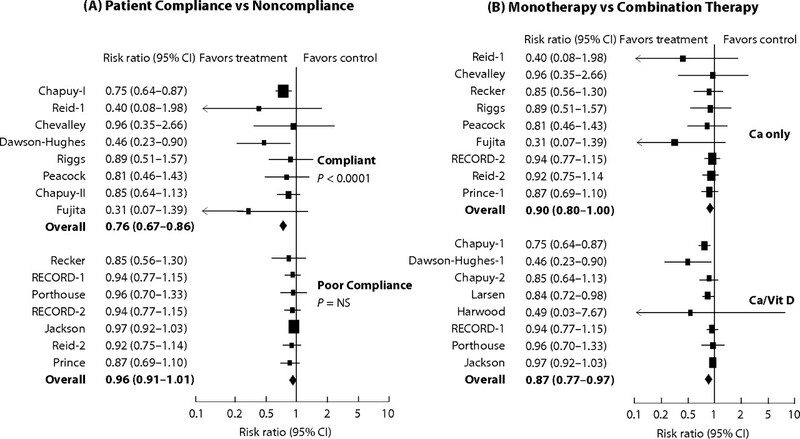 (B) Calcium monotherapy reduced all fractures by 10%, which does not produce a significant risk reduction in fractures. The combined effect of calcium plus vitamin D significantly reduced the risk for all fractures. Adapted from Tang et al. (18). Meta-analysis of Reid et al. of four studies of trials of calcium monotherapy in women found no reduction in nonvertebral fractures and an increased risk for hip fracture. Adapted from Reid et al. (23). 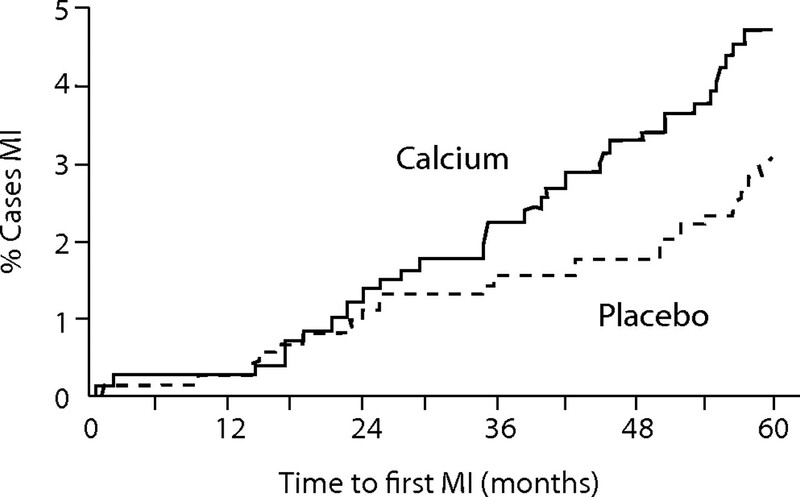 Calcium supplementation was associated with an increased number of cases of MI and a composite of MI, stroke, and sudden death. Table values are number of women (number of events). TIA, transient ischemic attack (25). Calcium Supplementation: Is It Harmful?